Bringing style and comfort to your living room, this chair features sleek track arms and metal legs in a chrome finish. A loose pillow seat back makes it easy get into a relaxing position. Pair with a sofa or loveseat for a more complete look in your living space. 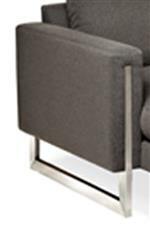 The Savino Contemporary Chair with Track Arms by American Leather at AHFA in the area. Product availability may vary. Contact us for the most current availability on this product.